As disciples of Jesus – we are called to imitate Him! (not our parents or ball players or anyone else. Do Paul and James Disagree on Justification by Faith Alone? Most of us struggle with fear of one sort or another at one time or another—some mild, some serious, some healthy, some unhealthy and self-defeating. Healthy fear is a self-protective mechanism. We rightly fear (or should) driving through a red light, or doing anything that could hurt us or others. Unhealthy fear is that which is caused by someone who hurt us deeply, and especially when we bury and deny it. This fear can become a floating anxiety and cause us to be fearful of everyday living, separate us from close relationships and cause loneliness, give us ulcers or other physical ills, or cause us to hide it and “protect” ourselves with anger. Fears that are relatively harmless can often be overcome by doing the thing we fear and thereby reconditioning our response to the particular thing we fear. Unhealthy or self-defeating fears need to be dealt with at their root cause. For example, a person who was abused or abandoned as a child may be fearful of being treated the same way as an adult. And, for some strange reason, unless he faces and resolves this fear, he will tend to either withdraw from close relationships or be attracted to people who will repeat the abuse or abandonment he experienced in the past. Sadly, the things we fail to resolve we are destined to repeat. As today’s Scripture points out, “The man [person] who fears is not made perfect in love.” Thus, to be made perfect in love means we need to resolve any unhealthy fears. To do this these fears need to be recognized and if repressed, they need to be brought into the conscious mind so they can be confronted and resolved. Look at the symptoms in your life. Do you avoid close relationships? Is your life filled with anxiety? Are you an angry person? Do you have any impaired close relationships? Is your marriage a wreck? If any of these apply to you, chances are you may have unresolved fear. So when you pray, admit these and any other symptoms to God and ask him to give you the courage to see the root cause of these—and to lead you to the help you need to overcome these. If the fears are buried, you may need qualified professional counseling help to overcome these. Speaking personally, buried fear was a major problem in my life until I realized that unless I got into therapy to resolve my fear, I would be running from love for the rest of my life. As we resolve unhealthy fears, we open ourselves to love, and the more we are filled with God’s love, the less fearful we will be because perfect love drives out fear. 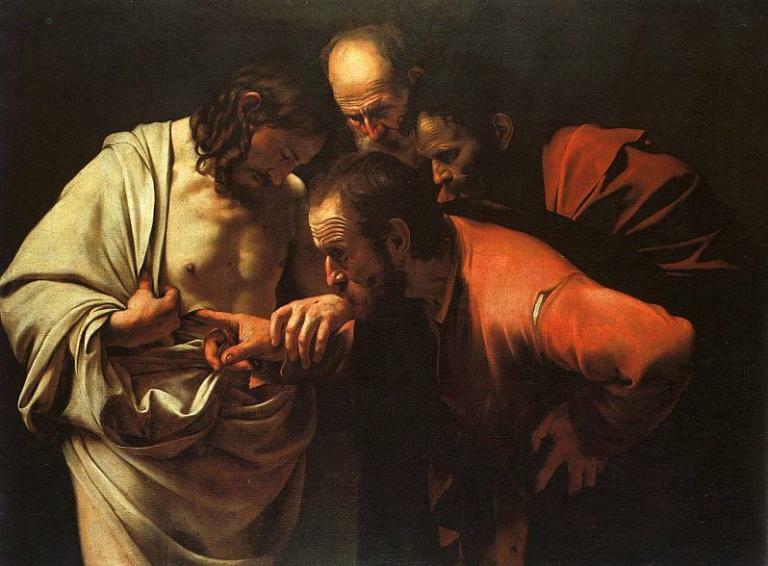 I’ve always loved the story of Jesus appearing to Thomas. Maybe it’s because of the skeptic in me. Growing up in the megachurch movement, I watched thousands of people around me every Sunday, swallowing a self-help gospel hook, line, and sinker. It wasn’t the Joel Osteen style, “you were born to win” sort of self-help gospel. I think that’s what it was so easy to digest to the usual churchy, Christian crowd. This kind of self-help gospel was a different style. It’s therapeutic quality was shrouded by claims of absolute morality, inerrancy of Holy Scripture, and the utter simplicity of the Christian life. It was out of this movement that a lot of the common quasi-spiritual cliches were born, catchphrases of self-reliance or pithy abdication, baptized with Christian culture god-language.